Night Sky Earrings featuring Genuine Acoma Jet inlaid in Sterling Silver. Beautiful Fire and Ice Lab Opal Shooting Stars! Post Earrings Designed by Navajo Artist Calvin Begay. Signed by the artist. 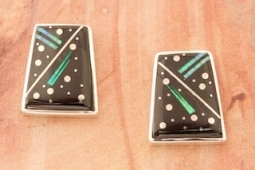 Post Earrings are 5/8" L x 1/2" W.